Hello my friends! 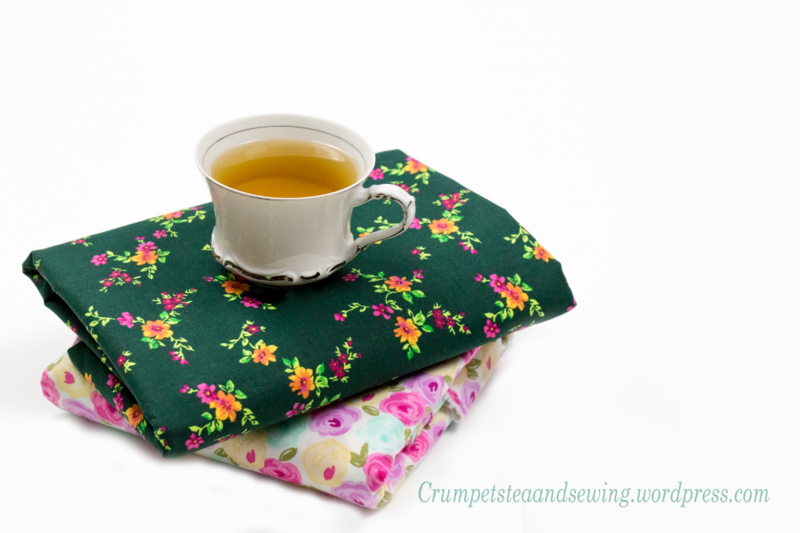 Welcome to another Crumpets, Tea, and Sewing blog post! Today, I will be doing a pattern review of the Simplicity Pattern 8769. It’s a renaissance coat costume that I made for my daughter. She will be wearing this as a Halloween Costume this year. The Simplicity 8769 pattern features a close-fitting costume coat with skirt, collar, and 12 buttons. The pattern calls for medium-weight stable fabrics such as Brocade, Taffeta, Crepe, and Linen Type fabrics. I chose a purple crepe fabric for the main body of the garment, and I used a black crepe fabric for the collar and center front of the garment. I also used the black crepe fabric for the cuffs of the sleeves. There are two variations of this pattern. Variation A features a hood and a front and back yoke, which is attached to the center front (at the collar and bodice). View A also features 12 tabs and 6 buckles used as closures, 8 tabs and 4 buckles are used at the center front of the coat and 4 tabs and 2 buckles are used on the sleeves. For variation B you would omit the hood and front and back yoke and tabs; that is the only differences between the two views. Variation B calls for 12 buttons instead of tabs. The classification/skill level isn’t stated on the envelope or on the instructions. Although, I would rate this pattern as an advanced intermediate pattern. There are a total of 24 given pieces (24 pieces for variation A and 10 pieces for variation B). View A is most definitely the most complicated variation of the two. After reading the instructions, I learned that adding the hood, back and front yoke, and the tabs present a bit of a challenge. I’m so happy that my daughter chose variation B. Luckily, she dislikes hoods. Overall, I love this pattern. The instructions were decent and the style and design of this pattern is unique.Nevertheless, this pattern was not without complications and this wouldn’t be a pattern review without any mention of my critiques. So here we go! The instructions for this pattern was wonderful for steps 1-37. But as soon as I reached step 38, everything went down hill. The instructions for step 38 are clear; however, I feel like there is a crucial step missing here. I presume that the designer/company didn’t include that step because this is an advanced intermediate pattern, and the assumption may be that anyone who is taking on such a pattern would know what he/she is doing. Nevertheless, I would suggest that such instructions be included. Mainly, I recommend that the designer be more specific as to how to attach the skirt facing to the skirt and bodice. The instructions say to “Stitch across front facing exactly 5/8″ above the lower edge and then along the seam line on front and upper edge of skirt, connecting to previous stitching.” While these instructions are clear, sewing the skirt front facing to the skirt at “exactly” 5/8″ SA does not match with the center of the bodice. Therefore, I had some complications getting the two pieces to align. As far as alterations and adjustments goes… no alterations or adjustments were made to this garment. However, I had expected to make some alterations to the front bodice of the garment because I cut a size too big. I planned to grade the pattern down to include the amount of ease that I needed for the garment. However, the pattern was not true to size. So I ended up with less ease in the garment than I originally anticipated. I made more comments about this complication below (in the things that I dislike about the pattern). Above anything else, I LOVE the button details on this garment! That’s one reason why I chose view B. This pattern features 12 buttons; 8 shank buttons are to be used on the center front of the bodice, and 4 shank buttons are to be used on the cuff of the sleeves (two buttons on each cuff). You would need to cut 6 elastic band strips at 2 1/2 inches long. You would then fold each one in half and sew them onto the garment (about 2 inches apart from one another). The elastic bands are used as closures for the front of the garment. You would wrap the elastic bands around the shank buttons to close the garment. At first, I thought I would not like this style, but after making the garment, I feel in love with it. I also like that I didn’t have to do any alterations to this pattern. I chose a size that closely matched my daughter’s measurements based on the finished garment measurements listed on the tissue pattern, and I planed to grade the pattern down from that point. Thankfully, the coat fit my daughter like a glove. However, I was surprised that the size I chose fit her because I cut a size that was too big. My daughter’s measurements are 36″, 32″, 40″. I cut a size 12; the finished bust garment measurements for this size is a 40″, which should have included 4″ of ease. This was not the case. The finished garment bust measurements have about 1 1/2″ of ease. If you intend to make this pattern, make a note of this and be sure to go up a size or two. In addition, the finished skirt is long. If you are short you will need to cut off several inches. I like everything about this pattern, except for how the skirt front facing is designed. I had a hard time sewing the skirt facing on at 5/8″ SA. Sewing the front facing onto the skirt at 5/8″ SA made it so that the bottom of the center front bodice wouldn’t lay flat or even. The instructions for applying the skirt front facing didn’t help either. It’s hard to explain it here. But if you are interested in seeing my review of this pattern and understanding the issues I had in more detail, checkout my YouTube channel here. I recommend that you carefully measure your bodice and skirt pattern pieces. The size I chose for my daughter should have had at least 4″ of ease in the bust and about 1 1/2″ of ease in the waist. This was not so. For the skirt front facing, you may need to sew the skirt facing to the skirt front at a 1/2″ SA or less. I think I sewed my front facing at 1/4″ SA, which is ridiculously small. But I couldn’t get the pieces to align no other way. Other than the minor complications I listed in this review, I love the pattern and would most certainly make another. Next time, I would like to make this pattern using variation A (with the hood and front and back yoke). Unfortunately, this costume coat does not look like a renaissance piece to me. It very much looks like something that Regina (the evil queen from Once Upon A Time) would wear. Hopefully, my daughter will get much wear out of it either way! I hope this review was helpful. For more details, visit my YouTube channel. You can also watch a short video on how I made these covered buttons on my YouTube channel here! Posted on September 30, 2018 October 2, 2018 by TeaPosted in UncategorizedTagged costumepatterns, dressmaking, sewing, sewingblog, sewingpatterns, simplicity, simplicitypatterns.